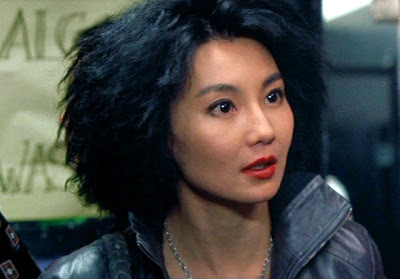 Doing a blog on recent Hong Kong actresses without Maggie Cheung Man-Yuk would be akin to writing a history of 20th century science and leaving out Einstein. It might be OK as far as it goes but there would be something missing. 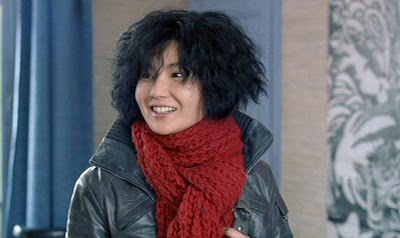 So here is Maggie from two non-Hong Kong movies, both written and directed by Oliver Assayas. 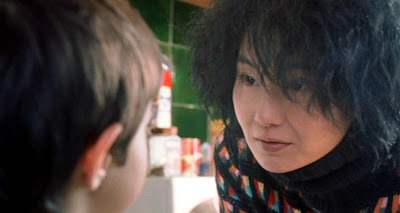 The first is "Irma Vep" a movie about making a movie in which Maggie plays a Hong Kong actress named Maggie Cheung who is hired part way through the shooting schedule in order to play the title role. It opens with a scene in a chaotic production office where, among other crises, it is realized that no one was sent to pick her up at the airport. When she does arrive it is clear that the director of the film (a remake of the classic "Les Vampyres") has lost control of the shoot. Speaking no French, Maggie is integrated as well as can be expected into the flow of the movie, both helped and hindered by the costume designer, a gay woman who has a major crush on her. While Assayas was commenting on the state of the French film industry 1996 he was also obviously showcasing Maggie with loving care--they married sometime after the movie wrapped. This is an exceptionally well made film and one I recommend most highly. The images below are screencaps I did from the DVD release. In the first three pictures above Maggie is in character as Irma Vep, jewel thief extraordiniare, clad in her black rubber suit and creeping about the hallways of a Paris hotel looking for victims. 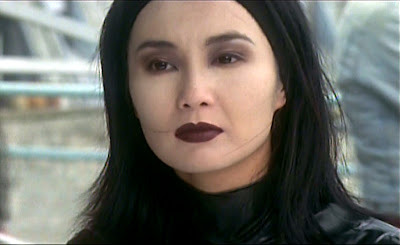 In pictures four through seven she is in character as Maggie Cheung, actress preparing to play the character Irma Vep and making the best she can of a production that is slipping out of control. The other movie is "Clean", a sprawling tale that takes place (and was shot in) Canada, the UK and France. 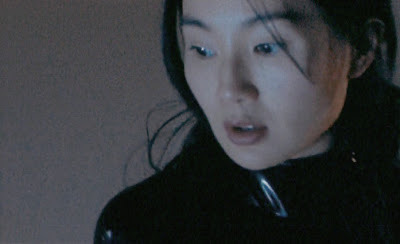 It is missing the dramatic unities and crystalline focus of "Irma Vep"--a lot more happens. Some characters die; some are betrayed by old friends while others take cynical advantage of family loyalties. Unlike "Irma Vep" it has an ending that wraps up the narrative and puts a definite end to this story--it is even upbeat but not cloying. 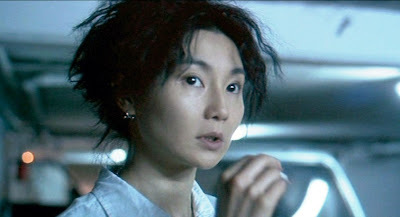 By no means a great movie or even a very good one, there is still an excellent reason to watch "Clean": Maggie Cheung has a tour de force of acting, never over the top, always in control and projecting exactly the right amount of fear, confusion, hope and joy that each scene calls for. Her performance could be a master class in film acting. One note: while these pictures might make it look as if the hairdresser was a sworn enemy it actually worked quite well in the movie. 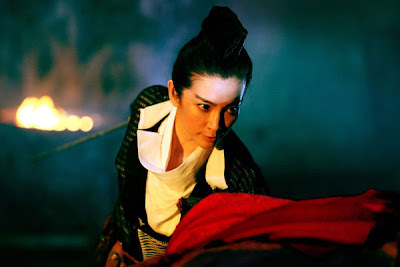 Is Li Bing-Bing in Detective Dee channeling Brigitte Lin from Ashes of Time or Swordsman 2? 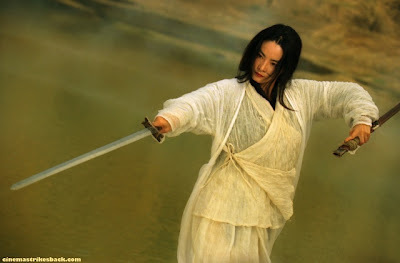 Probably not although Lam Ching-ha would certainly be an appropriate actress to emulate, particularly in this role. 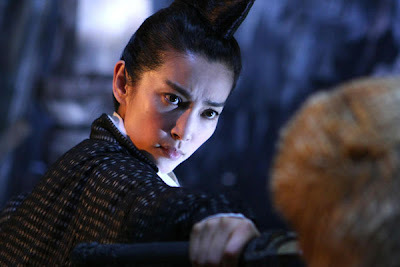 Dennis Lee had posted some stills of Li Bing-Bing from the currently shooting Detective Dee and her look of fierce determination, her intense concentration and even the angle of her head makes me think of Brigitte Lin in some signature roles. 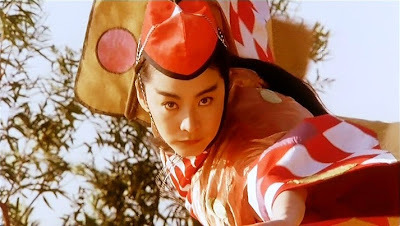 Or maybe it is that Brigitte Lin's look is so iconic that any Chinese actress will echo some part of that look in a similar scene. Or I could just be seeing something that isn't really there at all. Yasmin Ahmad is a Malaysian director who died recently and unexpectedly after suffering a stroke during a planning meeting for an upcoming project. She was a talented artist with an extraordinarily ethical and humane world view that she expressed in her work. All I have seen are short commercials she did for the governments of Singapore and Malaysia, PSA type things done with rare artistry, but her movies have won prizes at film festivals throughout the world. "Mukshin" won a Crystal Bear at Berlin in 2007; she was on the jury for that award in 2008. Her films have been honored at festivals in Tokyo, Manila, Malaysia and Créteil, France which is quite an accomplishment for a director with only six feature films, one of which was released just a few months ago. Her movies aren't really distributed in the west--Amazon.com has used copies of "Mukshin" in Region 2 PAL format DVD--you can find that here while Netflix has it listed as "not yet available, release date unknown" for the Region 1 or 0 DVD. I have seen a number of her commercials including "Funeral" a real gem which you can see at YTSL's blog at the url below. This is a real celebration of the multi-ethnic society of Malaysia and of Singapore. The people gathered to celebrate the life and mourn the death of David are ethnically and (one imagines) religiously heterogeneous. There are couples of the same race and others of mixed races--like David and his widow. She looks, dresses and sounds Indian while the picture of David shows he was Chinese. The ethnic diversity of the mourners is taken as given--each of them was connected to the family in different ways but all are united in their grief. The elderly Chinese couple who are foregrounded toward the end of the piece might be David's parents. They are cheered and comforted by the first outrageous but then very loving speech by their daughter-in-law. The audience (at the funeral, standing in for the audience watching on television) react first with concern--"has Mrs. Lee lost her mind with grief and is telling inappropriate stories at her husband's funeral" to relief "Oh, she is actually making sense" to laughter and finally to understanding. "Funeral" is a delightful, low key and effective statement that the important things in a person's life are the same not matter what their racial make-up might be. YTSL has several of Yamin Ahmad's videos, Including "Funeral" here and a post about a personal encounter with her here. Brian has reviews of Talentime and Mukshin. Another good review of "Mukshin" is here. While this is beyond the stated scope of this blog Yasmin Ahmed's short films were so appealing that I wanted to point them out. She was a very special and much loved artist, all but unknown in the United States. One of the things I find amazing about her is that she was an executive for Leo Burnett which has been famous for as long as advertising agencies have been famous. Her commercials were made for important, high profile clients and show that creativity and sensitivity possible even working with formal and client-driven constraints. I hope her films will soon be available in the United States. 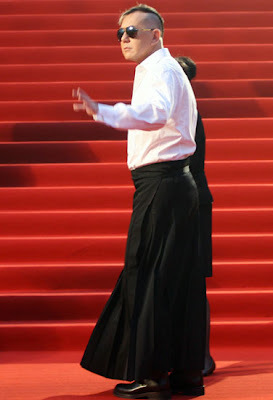 A video of Karen Mok and Danny Boyle at the Shanghai International Film Festival. Karen Mok looks like she was born to strut on the red carpet while Danny Boyle looks a bit stiff. Actually really stiff. Things are more casual at Shanghai then Hollywood or Cannes--at 16 seconds into the video three women, possibly ticketholders looking for their seats, come through the same door that the celebrities used, begin walking straight toward the camera and then sheer off. 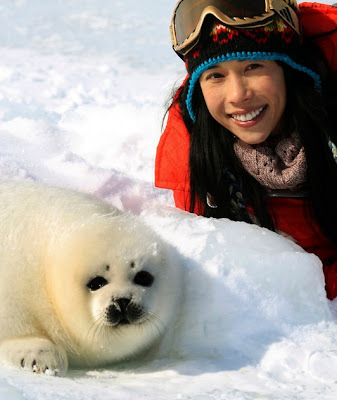 A few more pictures although not from Shanghai, simply because she is Karen Mok. 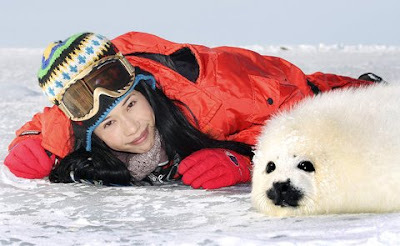 Saving the baby seals with the Hong Kong SPCA, pictures from the Taipei Times. From the Asian Film Awards in Hong Kong, March 2009 wearing a Roberto Cavalli dress. Note that she has changed watches for each picture, probably three different models from a watch company she endorses. The patterned hose may have looked great at the awards butnot in the pictures. A screen cap from "So Close", a movie which everyone in the world should see many times. One thousand thanks to duriandave for some handy and timely advice on videos. Another look at some of the most beautiful actresses in the world on the red carpet at the opening of the Shanghai International Film Festival. As is always the case at events like this there were some great looks along with a few that were stunningly bad. 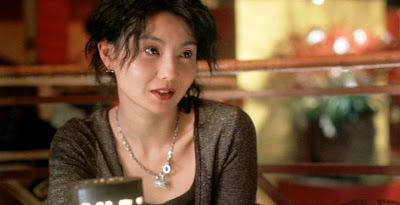 This is Yuan Li who has the figure to be this generation's Amy Yip. A classic little black dress doesn't distract from her signature look. Since she isn't wearing any accessories this shot may be from a lighting or tech rehearsal. If Lin Chi-Ling can't make a dress look good no one can. This number looks tacked together from curtains and tableclothes so she can't. Tang Yan has such a delightful smile that it almost makes you forgive whoever decided to stick her in a dress made from a shower curtain. At least it matches her purse. And here is Tang Yan in "La Lingerie". She doesn't need a shiny dress to look good. Charlene Choi and Yumiko Cheng look pleased to be on the red carpet, and to have escaped whatever caused some of the other actresses to wind up in such odd outfits. Zhou Xun wearing an atrocious gown with the biggest, pinkest bow imagninable. This dress is a bad joke and Zhou Xun looks like she is tired of hearing it. Check out the bottom of the pink shell/cloak/thing in the second picture--it looks unfinished as if someone had grabbed a pink satin sheet, tied a big bow and hit the hem with pinking shears backstage just before she came out. She has a real "When will this be over" look. From the casual standing-around look of the background in the top picture it might also be from a rehearsal and by the time of the official red carpet walk she really understood the horror of her outfit. In contrast to the unfortunate Zhou Xun, here is Huang Yi in a perfect combination of a little black dress with simple but lovely accessories. Less can be more. To end this post on a positive note, Chen Hao is delightfully coquetteish glancing over her shoulder in a blue dress--great color for her--with a deep U back. Concerned that there might be someone somewhere who hasn't seen every image of every actress from the 2009 Shanghai International Film Festival red carpet I decided to mine Google images once again for photos from Sina.com, CRI English and Yahoo Singapore. Here is the first batch, leading off with Zhang Ziyi in white and Fan Bingbing in red. Each of them is breathtakingly gorgeous on her own and together they could cause beauty overload. The unfortunate actor rendered all but invisible standing next to them in the picture to the left is South Korean So Ji Sub. The two of them looking at the photographer and through him directly at the viewer tell us why Agamemnon and Achilles sailed for Troy--either of these faces could launch a thousand ships. Two beautiful women, confident in their beauty and (one imagines) aware and comfortable with its devastating effect. Han Xue looking as cut as a box of puppies in a simply cut frock, understated but approriate accessories and perfectly arranged hair. There are a lot of reasons to love Hong Kong movies. Two of the best reasons are blogs that I follow every day and have mentioned here in the past. One is WEBS OF SIGNIFICANCE which covers Hong Kong life generally including the movies. There are many people who write about the Jade Screen—YTSL, who runs Webs of Significance writes the way most of us wish we could. That she is a terrific photographer with a good eye for what Hong Kong such an intriguing city where the amazing is commonplace. But what led me to her blog and kept me coming back were her well written and very well reasoned (meaning, of course that I agreed with her) reviews. 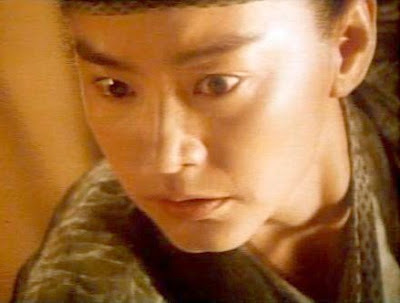 An example is her discussion of one of Leslie Cheung’s best movie outings which can be found here: He's a Woman, She's a Man review. Since YTSL says that this “was at least my 20th viewing” of this film she is perfectly situated to review it. Having seen a few movies that often—Casablanca, Singing in the Rain, In the Mood for Love—I know it is may be the best way to understand everything about what is on the screen. The late Gene Siskel, who loved “Saturday Night Fever” as much as anyone could (go figure) wrote about learning more about it on the tenth viewing than he did on the first. If you follow the link View from Brooklyn Bridge you will come to her review on Brian’s invaluable blog. It is the movies themselves, not only how they are reviewed and remembered, that can make one (at least this one) enthused to the point of obsession. The way they are made and promoted, in many cases much different from what those of us raised on Hollywood product expect, makes them, if not unique then very different from expectations. An example of this is the almost casual way that a film crew will set up on a busy street and the more than casual way that the people on the street will take not of or ignore what they are doing. 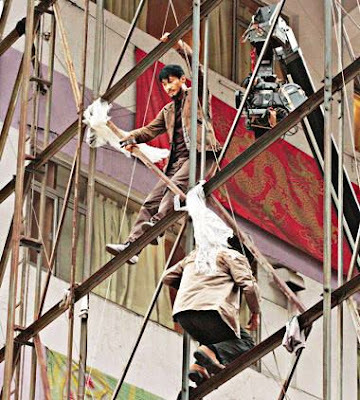 Some photos from a scene of a movie with Leon Lai currently being shot show the star and a stuntman on a scaffolding, rigged for a fall, then a much wider view with the two of them circled showing just how uninterested the vast majority of people are to yet another movie. The sidewalk immediately beneath the scaffolding—where the airbag is located to break the fall—has been cordoned off but not very strictly. 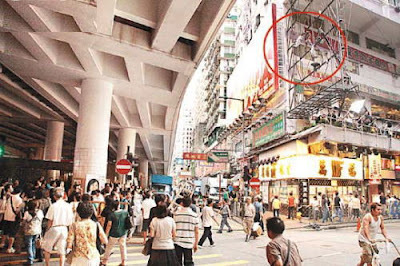 The wider shot shows that all the impedimenta of a shoot is there on a platform beneath the scaffolding including a big reflector that no one could have missed but most citizens simply don’t find it that compelling, as if not only movies but making movies continues to be such a part of the daily life in Hong Kong that it is just something happening in the background.